He gets the brain science right. Skill acquisition is something that happens in the brain. If you want to influence the way you learn a new skill, you need to understand how learning actually works - in your brain. 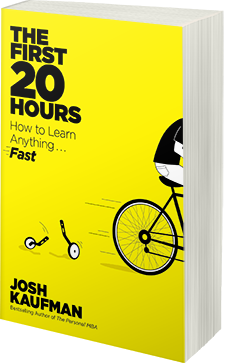 I've been studying behavior change, skill development and the human brain for over 25 years, and I can tell you this: Josh Kaufman did his homework. It's a real how-to book. I recently read another popular book about learning, The Power of Habit, by Charles Duhigg. It does a fair job of explaining habits, but the No. 1 question any reader would have - "How do I change a bad habit?" - isn't addressed until the end, in a 10-page appendix. Explaining how to acquire skills is addressed throughout Kaufman's book - all 258 pages of it. The book delivers. He presents a relatively simple approach to acquiring a skill as quickly as possible, one that is 100% aligned with the neuroscience of learning. He accomplishes this in the first 40 pages, then in the rest of the book he illustrates this method using six interesting skills he acquired during a single year. Throughout, he keeps it simple. At the end you're left with the thought: "I can do that." He has a wonderful conversational style. It's as if this really friendly guy who knows what he's talking about is sitting across the table explaining things - without any of the boring academic or technical B.S. It's practically impossible to misunderstand his message. He introduces his method by contrasting it with one of the themes of Outliers, by Malcolm Gladwell. Gladwell's book became famous for the claim that if you want to become a world-class expert in anything, you have to invest at least 10,000 hours of practice. So now people everywhere are saying, "I'd better start putting in my 10,000 hours." Kaufman makes a very important point: almost no one wants to become a world-class expert. All most people want to do is achieve "sufficiency," or "the capacity to perform well enough for your own purposes." The whole point of his book is that you can achieve this with about 20 hours of concentrated, intelligent, focused effort. His method is to break the skill you want to learn into subskills. Then, do your homework to get background information about each subskill so you can practice intelligently and critique yourself. Remove all barriers to practice, then practice the most important subskills first - at least 20 hours each. He then explains 10 principles of rapid skill acquisition. The first is to learn to do something you really love. That way you'll be motivated enough to do the required practice. Another principle is to focus on one skill at a time. When I read this, I became a true convert. I've been preaching focus in my own work for years; it's a critical guideline that practically no one in the learning and development business mentions. As for the other eight principles, well...read the book! Even though what he promises is exciting and empowering, Kaufman is thoroughly realistic about his recommendations. "If you want to acquire a new skill, you have to practice. There is no other way. You can prepare. You can research. You can eliminate distractions and alter your environment to make it easier to practice. You can find intelligent ways to make your practice more effective or efficient. But, in the end, you must practice." You gotta do the reps.
Great to find out about the Book and ideas your bring forward at your blog. really loved reading all those content and interesting information.